We are running into a strange behavior where we see high CPU utilization but quite low load average. The behavior is best illustrated by the following graphs from our monitoring system. At about 11:57 the CPU utilization goes from 25% to 75%. The load average is not significantly changed. We run servers with 12 cores with 2 hyper threads each. The OS sees this as 24 CPUs. 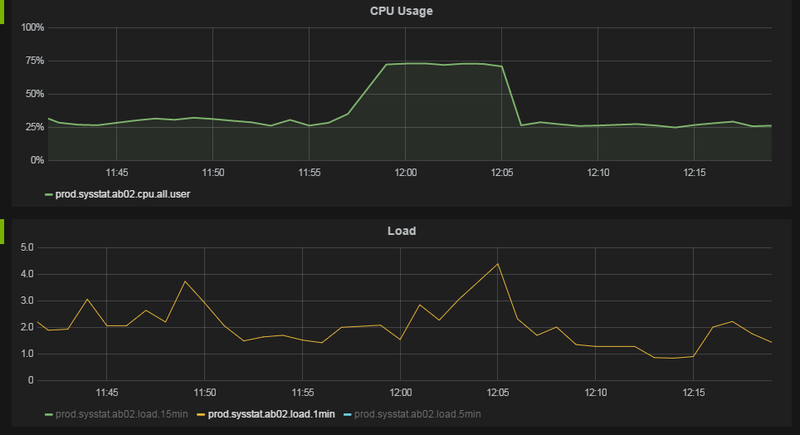 The CPU utilization data is collected by running /usr/bin/mpstat 60 1 each minute. The data for the all row and the %usr column is shown in the chart above. I am certain this does show the average per CPU data, not the "stacked" utilization. While we see 75% utilization in the chart we see a process showing to use about 2000% "stacked" CPU in top. The load average figure is taken from /proc/loadavg each minute. We run a couple of Java web applications under fairly heavy load on the machines, think 100 requests/s per machine. If I interpret the CPU utilization data correctly, when we have 75% CPU utilization it means that our CPUs are executing a process 75% of the time, on average. However, if our CPUs are busy 75% of the time, shouldn't we see higher load average? How could the CPUs be 75% busy while we only have 2-4 jobs in the run queue? Are we interpreting our data correctly? What can cause this behavior? On Linux at least, the load average and CPU utilization are actually two different things. Load average is a measurement of how many tasks are waiting in a kernel run queue (not just CPU time but also disk activity) over a period of time. CPU utilization is a measure of how busy the CPU is right now. The most load that a single CPU thread pegged at 100% for one minute can "contribute" to the 1 minute load average is 1. A 4 core CPU with hyperthreading (8 virtual cores) all at 100% for 1 minute would contribute 8 to the 1 minute load average. Often times these two numbers have patterns that correlate to each other, but you can't think of them as the same. You can have a high load with nearly 0% CPU utilization (such as when you have a lot of IO data stuck in a wait state) and you can have a load of 1 and 100% CPU, when you have a single threaded process running full tilt. Also for short periods of time you can see the CPU at close to 100% but the load is still below 1 because the average metrics haven't "caught up" yet. I've seen a server have a load of over 15,000 (yes really that's not a typo) and a CPU % of close to 0%. It happened because a Samba share was having issues and lots and lots of clients started getting stuck in an IO wait state. Chances are if you are seeing a regular high load number with no corresponding CPU activity, you are having a storage problem of some kind. On virtual machines this can also mean that there are other VMs heavily competing for storage resources on the same VM host. High load is also not necessarily a bad thing, most of the time it just means the system is being utilized to it's fullest capacity or maybe is beyond it's capability to keep up (if the load number is higher than the number of processor cores). At a place I used to be a sysadmin, they had someone who watched the load average on their primary system closer than Nagios did. When the load was high, they would call me 24/7 faster than you could say SMTP. Most of the time nothing was actually wrong, but they associated the load number with something being wrong and watched it like a hawk. After checking, my response was usually that the system was just doing it's job. Of course this was the same place where the load got up over 15000 (not the same server though) so sometimes it does mean something is wrong. You have to consider the purpose of your system. If it's a workhorse, then expect the load to be naturally high. Load is a very deceptive number. Take it with a grain of salt. If you spawn many tasks in very quick succession which complete very quickly, the number of processes in the run queue is too small to register the load for them (the kernel counts load once every five seconds). Consider this example, on my host which has 8 logical cores, this python script will register a large CPU usage in top (about 85%), yet hardly any load. Another implementation, this one avoids wait in groups of 8 (which would skew the test). Here the parent always attempts to keep the number of children at the number of active CPUs such it will be much busier than the first method and hopefully more accurate. The reason for this behaviour is the algorithm spends more time creating child processes than it does running the actual task (counting to 10000). Tasks not yet created cannot count towards the 'runnable' state, yet will take up %sys on CPU time as they are spawned. So, the answer could really be in your case that whatever work is being done spawns large numbers of tasks in quick succession (threads, or processes). If the load average doesn't increase much then it just means that your hardware specs and the nature of the tasks to be processed result in a good overall throughput, avoiding them to be piled up in the task queue for some time. If there was a contention phenomenom because for instance the average task complexity is too high or task average processing time takes too many CPU cycles, then yes, load average would increase. The exact formula of load average calculation is : loadvg = tasks running + tasks waiting (for cores) + tasks blocked. Load average includes tasks that are blocked on disk IO, so you can easily have zero cpu utilization and a load average of 10 just by having 10 tasks all trying to read from a very slow disk. Thus it is common for a busy server to start thrashing the disk and all of the seeking causes lots of blocked tasks, driving up the load average, while cpu usage drops, since all of the tasks are blocked on the disk. While Matthew Ife's answer was very helpful and led us in the right direction, it was not exactly the what caused the behavior in our case. In our case we have a multi threaded Java application that uses thread pooling, why no work is done creating the actual tasks. However, the actual work the threads do is short lived and includes IO waits or synchornization waits. As Matthew mentions in his answer, the load average is sampled by the OS, thus short lived tasks can be missed. I made a Java program that reproduced the behavior. The following Java class generates a CPU utilization of 28% (650% stacked) on one of our servers. While doing this, the load average is about 1.3. The key here is the sleep() inside the thread, without it the load calculation is correct. To summarize, the theory is that the threads in our applications idle a lot and then perform short-lived work, why the tasks are not correctly sampled by the load average calculation. Load average is average number of processes in the CPU queue. It is specific for each system, you cannot say that one LA is generically high on all systems, and another is low. So you have 12 cores, and for LA to increase significantly the number of processes must be really high. Another question is what is meant by the "CPU Usage" graph. If it's taken from SNMP, like it should be, and your SNMP implementation is net-snmp, then in just stacks CPU-load from each of your 12 CPU. So for net-snmp the total amount of CPU load is 1200%. If my assumptions are correct, then the CPU usage didn't increased significantly. Thus, LA didn't increased significantly. The scenario here is not particularly unexpected although it is a little unusual. What Xavier touches on, but does not develop much, is that although Linux (by default) and most flavours of Unix implement pre-emptive multi-tasking, on a healthy machine, tasks will rarely be pre-empted. Each task is alotted a time slice for occupying the CPU, it is only pre-empted if it exceeds this time and there are other tasks waiting to run (note that load reports the average number of processes both in the CPU and waiting to run). Most of the time, a process will yield rather than being interrupted. (in general you only need to worry about load when it gets close the number of CPUs - i.e. when the scheduler starts pre-empting tasks). if our CPUs are busy 75% of the time, shouldn't we see higher load average? Its all about the pattern of activity, clearly increased utilization of the CPU by some tasks (most likely a small mintority) was not having an adverse effect on the processing of other tasks. If you could isolate the transactions being processed, I would expect you would see a new group emerging during the slowdown, while the extant task set was not affected. One common scenario where high CPU can occur without a big increase in load is where a task triggers one (or a sequence) of other tasks, e.g. on receipt of a network request, the handler routes the request to a seperate thread, the seperate thread then makes some asynchronous calls to other processes.... the sampling of the runqueue causes the load to reported lower than it really is - but it does not rise linearly with CPU usage - the chain of tasks triggerred would not have been runnable without the initial event, and because they occur (more or less) sequentially the run queue is not inflated. Not the answer you're looking for? Browse other questions tagged linux cpu-usage troubleshooting load-average or ask your own question.